Esther Friesner is an award-winning and best-selling author with over 30 books to her name, including Men In Black 2, E.Godz with Robert Asprin, Nobody's Princess, Sphinx's Princess, and two Star Trek novels. She's also the editor of the Chicks in Chainmail anthologies. 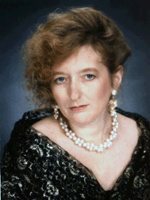 Esther Friesner has won two Nebula awards, the Romantic Times award for Best New Fantasy Writer and the Skylark Award. Note that you can also listen to this while you read it. [Are you drawn towards] the humorous side? Cause you do have a lot of humor in your books. Esther Friesner: I do. I do because humor, if it’s well done, can make people think about things, especially things that might need a little bit of correcting in the way we are acting towards one another. And using humor to open up people’s minds, to make them think about things the way they might not have done because, well, you know, you go through your day, you’re working hard, and especially now in this economy people are working hard and are a little bit frightened, because, well, it was a perfectly good economy and then well, somebody broke it. I’m not naming any names, but a few years back it was working perfectly fine. Anyhow, yes, the thing is that humor is a gentle way to get people to look over there and see that perhaps what you’re doing here is not the best you could be doing for this world. It’s supposed to teach; it’s supposed to make you think. It’s not supposed to be hitting you over the head with a moralizing hammer, because most people just run away from that, like crazy. I like it when somebody comes over to me and says, “You know, what you wrote, this particular story, it did make me realize--oh! You know, you’re right.” And some of my favorite humorists to read do exactly that. Matthew Peterson: I like to read humor because it helps me to realize, you know, life has a lot of bad things in it, but also there’s a lot of good stuff; there’s a lot of funny things. Matthew Peterson: You can make fun of lots of funny things. Esther Friesner: Yes. And we’re basically nice. Most human beings are good. Really, because if we weren’t, what would the news be? The news wouldn’t be, this went wrong and that went wrong. The news would be “Man adopts kitten.” Because it’s something out of the ordinary. But no, the news is the bad things, usually. Esther Friesner: Sometimes it’s a good thing. Matthew Peterson: Now, I have to say something. My wife, she told me about this interesting story, and I think you’ll get a kick out of this. So the police are chasing this car; it’s driving erratically. And the car pulls into a driveway and a little 8-year-old boy runs out and goes into the house. And it was an eight year old boy . . .
Esther Friesner: Oh my gosh! Esther Friesner: Oh, yes he did! How did he reach the pedals? Matthew Peterson: I guess what they said is that he would go down and floor onto the pedal and then come back up and put his head over the steering wheel. Esther Friesner: Oh, thank heaven he was alright! Matthew Peterson: Oh, I know, he was safe. Esther Friesner: Oh my Lord. Matthew Peterson: But they have video of it because the police officer cars now have video. I just couldn’t believe it. It’s just one of those things. I’m glad he wasn’t hurt of course, and nobody was hurt, but just when you think about it later on, it’s unusual. Esther Friesner: Well, one of my favorite humor quotes is by Beaumarchais who wrote The Barber of Seville. I think, well, whatever Figaro is based on, and he said, “I laugh so that I am not obliged to weep.” Because some of the things you see in the world can make you feel so angry and so helpless, but if you’re able to approach them with humor, you can sometimes conquer them. Tyrants are afraid of humor because it cuts them down to size. And I’ll tell you something about humor, which has probably been attested to. My father was a Holocaust survivor. And he came out of the Holocaust with his sense of humor intact and active. He was a brilliant man and he could still take a joke and make a joke. My time with my father, he would read Pogo to me; he would watch Rocky and Bullwinkle with me. And he’s the reason why I am one of the apparently few women who like The Three Stooges. Esther Friesner: We would watch The Three Stooges together and he got me interested in Danny Kaye and Victor Borge. Now there is a book called, I don’t know if it’s still in print or not, but it’s called, “Laughter in Hell.” And it’s about humor during the Holocaust and about how people used humor as a device to keep their spirits up and to get through. And then you have the Roberto Benini, Life is Beautiful movie, which came out much later than the book. Same deal. And it’s true; humor is a marvelous, marvelous weapon. Esther Friesner: [talking about co-authoring with Robert Aspirin] . . . and I finally met him, but it was long after the book was done. Matthew Peterson: What was it? I wrote it down . . . let’s see. Matthew Peterson: E.Godz, yeah, that was the book. And so how much input did he have? Esther Friesner: Well, the way it worked, when I signed the contract, I didn’t know how it was going to work, and then I was told that he was going to write the outline and I was going to write the book. And so I received the outline which said what’s supposed to happen in each chapter and took it from there and turned it in and Bob’s your uncle. Esther Friesner: Yes, Bob is in fact, your uncle. Matthew Peterson: That is, yes. Esther Friesner: [referring to Terry Pratchett at the Discworld convention that we were at] And I’ll tell you, it’s good that Terry talks, because he’s always so wonderful. Esther Friesner: He has such nice insights. You know it’s not all jokes. He’s . . . I have said it, and I will say it again, he is a genius and it’s marvelous that we have his work. Esther Friesner: Try and stop him. Matthew Peterson: Temping Fate, from Penguin. Esther Friesner: Oh, it’s Temping, Temping, not Tempting. Esther Friesner: Right, because the girl is a Temp, who works for the Greek gods. Matthew Peterson: Ah. And Nobody’s Princess. Esther Friesner: Nobody’s Princess and Nobody’s Prize.